On Tuesday, March 1st, roughly 100 people attended our Books and Brews discussion with Beth Macy, author of Factory Man. The evening was hosted by WMRA's Martha Woodroof. 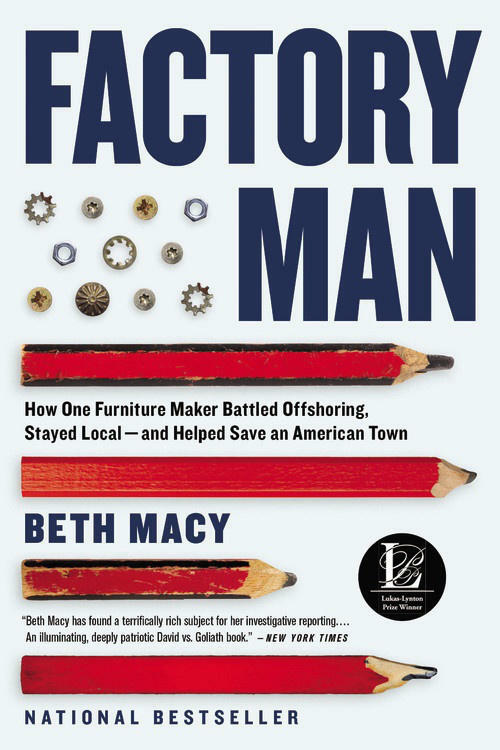 Factory Man: How One Furniture Maker Battled Offshoring, Stayed Local — and Helped Save an American Town is based on the true story of furniture factory owner John Basset III and his efforts to fight global market forces and keep his 700 factory workers employed. Beth Macy is a journalist who writes about outsiders and underdogs. Her writing has won more than a dozen national journalism awards, including a Nieman Fellowship for Journalism at Harvard and the 2013 J. Anthony Lukas Word-in-Progress award for Factory Man: How One Furniture Maker Battled Offshoring, Stayed Local -- and Helped Save an American Town, published by Little, Brown and Company in July 2014. She lives in Roanoke, Virginia, with her husband Tom, her sons, and rescue mutts Mavis and Charley.